Posted by themidlifesecondwife in Humor Me, The Cultured Life, What's the Buzz? First things first. The woman in this picture is not me. I’m talking especially to those of you who know me. Now, for those among you who do not know me and have never seen a picture of me, I will permit you, just this once, to visualize the Midlife Second Wife as resembling, somewhat, this paragon of pulchritude. Except imagine her wearing glasses. And to those among you who do not know the identity of the woman in the picture, patience. All will be revealed in due time. Ms. Thomas is starring in the Broadway hit Relatively Speaking, which is a collection of three one-act comedies, all directed by actor John Turturro (Barton Fink, Quiz Show, The Cradle Will Rock). The plays are Talking Cure, written by filmmaker Ethan Coen (Fargo, The Big Lebowski, No Country for Old Men); George is Dead, written by actress, screenwriter, and director Elaine May (The Heartbreak Kid, Heaven Can Wait, The Birdcage), and Honeymoon Hotel, written by Woody Allen (Midnight in Paris, Annie Hall, Manhattan). Ms. Thomas stars in George is Dead as Doreen, a woman whose husband has just died. Yes, I said this is a comedy. Ms. Thomas invited friends of her Facebook page to submit their very best essays about a family member. The essays, she advised, could be funny or poignant, but they had to represent one’s best work. 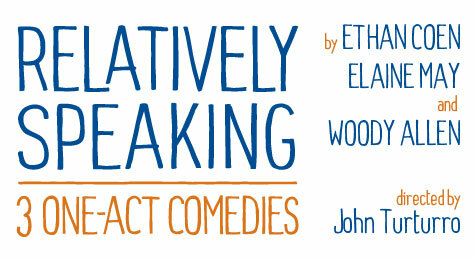 Five winners would be selected, and they each would receive a pair of tickets to see Relatively Speaking. Yesterday I received an e-mail from Ms. Thomas’ assistant telling me that I was one of the winners. Have you ever been in a situation where you’ve received incredibly amazing news and, due to the circumstances, were unable to adequately express your true feelings? I think I pulled a muscle trying to curb my enthusiasm. I was in a meeting with our financial planner at the time, happened to glance at my iPhone while she was looking something up, and saw the e-mail. I need a new word for thrilled. Also for gobsmacked, jazzed, stoked, excited, happy, and on-cloud-nine. I’m so excited to announce the winners of my Relatively Speaking essay contest! Thanks to all who entered. The winners are…. Siobahn Weiss, Anthony Martin, Nina Meditz, Kathleen Marshall, and Marci Rich. We will email you the play vouchers shortly! John and I are now scrambling to make plans to get to New York. The tickets are valid from today through December 1. Yes. That’s right. Just one more thing to add to my to-do list during National Blog Posting Month. Marlo (may I call you Marlo? ), thank you for choosing my essay. John and I can’t wait to see the play. I hope I’ll have the chance to thank you in person after the performance. And now, about that woman at the top of the page. She’s a central figure in my essay, so if you can just hold on a moment longer, you will soon know all. Sunday nights meant only one thing when I was a child: a drive to Lorain, Ohio, with my mother and father, to visit my Sicilian grandmother. Grandma Monia, my mother’s mother, was a widow who lived in the family home with the youngest of her four children, my unmarried Aunt Helen. Grandma spoke very little English; she had arrived at Ellis Island, as did so many immigrants, early in the 20th-century. An only child, I was the youngest of my cousins. By the time I came along, my grandmother was so hobbled by arthritis and osteoporosis that she was confined to the house, and walked, doubled over, with the help of a cane on wheels. Because of this, her world was small. It contained a window, though: the flickering light of the black and white console television that my aunt had bought with her secretarial salary. Grandma’s two favorite television programs were broadcast on Sunday evening—the Lawrence Welk and Ed Sullivan shows. She rarely commented during these broadcasts (and, truth be told, she could not understand much of the dialog), but we knew which guests and segments held her interest. She would smile in approval at the harmonizing Lennon Sisters, for example. She would clap with delight at Topo Gigio’s antics; she certainly knew that he was an Italian mouse, and if she couldn’t quite make out what he was saying to Ed Sullivan, she was nevertheless charmed by his sweetness, especially when Mr. Sullivan “keesed” him goodnight. Acts that were, in her view, less wholesome (dancers gyrating to the Twist, say, or a tad too much cleavage in a female performer’s costume) would elicit a frown or a shake of her head. She might be at a loss for English, but she was still a critic. One such evening in her living room, with my parents engaged in conversation with my aunt and me preoccupied with my Barbie doll, we were startled by a most unexpected reaction from her. Ed Sullivan was announcing his guests for the evening, and one name filled her with excitement. “Lollobrigida! Lollobrigida gonna be on!” she exclaimed. The thought, then, of my grandmother welcoming into her living room the great Gina Lollobrigida, an actress who had brought pride and acclaim to Italy (despite her frequent décolletage, which, for some reason, my grandmother conveniently overlooked), was beyond thrilling. If there had been time, she would have asked Aunt Helen to place an overseas call to the relatives in Palermo, so that she could inform them of the great thing about to happen in America. So focused were we on Grandma and her reaction that we hardly paid attention to what the estimable host was saying about his guest. We were now, with her, poised for the advent of the glamorous Lollobrigida. And out walked a man in a scuba suit, legs splayed, flippers flapping across the stage. Thanks Linda! It’s going to be a whirlwind! Lucy and I watched “To Kill A Mockingbird” last night (her middle name comes from the author) and she told me she always thought it was “Tequila Mockingbird. Brian! So happy to see you here! I’m going to have to start a page for “Humor Me” to collect witticisms such as this. Thanks for sharing and reading! Congrats Marci!! Can’t to hear about your trip from John. Great writing! Congrats (Are you sure that’s not your picture?) I think I remember you looking just like that, but then my memory is somewhat biased! Hah! I know who you are, “spanlocal.” Thanks for reading the blog! Congrats to you! This was a great entry! I am also a writer and also was one of the winners (kathleen marshall). I am scrambling to get to NYC now too. Good luck to you and keep writing! Thanks very much, Kathleen! And congratulations to you, too! Awfully nice of you to visit my blog. I’d love to know more about your writing. Wonderful essay. Loved reading it! Thanks very much! Glad you liked it!